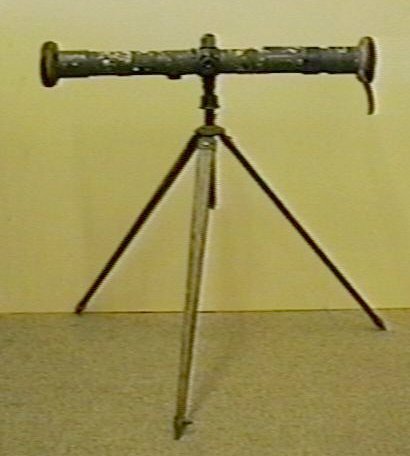 Metal cylinder of about 10 cm in diameter stands on a tripod. Objective lens with rotating cover at each end and eyepiece at centre. Thumbwheel adjustment at right side. This instrument was used to determine the distance to an object with the use of mirrors and lenses. The coincidence range finder could be summed up as being made up of two simple telescopes separated by a known distance. With a target object located and a range needed, the range finder is adjusted so that the two fields of view from the two telescopes are given in a single field of view. One is inverted in a central window. This view may be observed through the eye piece located at the centre of the range finder. The two images are brought into coincidence horizontally by adjusting a roller geared to a distance scale. This technology was primarily developed for the use in artillary in war. With the range to the enemy vital, range finders where easy to use and fairly accurate. They have also been used in such things as range finders for cameras as well as particular surveying jobs.